So today we finally figured out (sort of) what is this new Star Designers contest about. We first got this message in our inboxes. 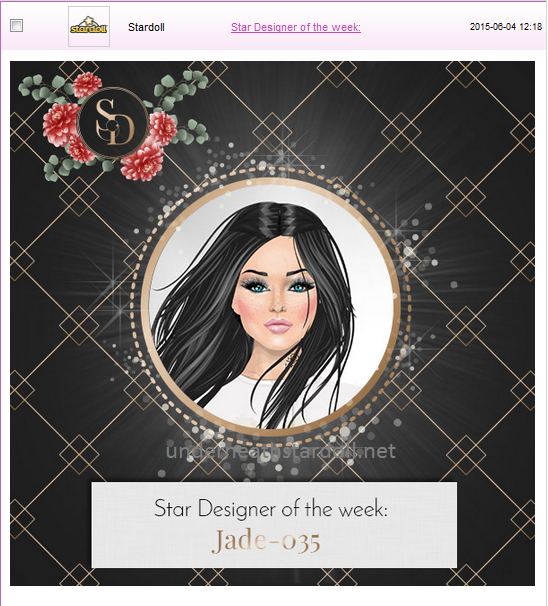 So it appears Stardoll chose a Star Designer of the week. I still don't know what criteria they used choosing her. When you click on the message, it takes you to the following page. According to the image above, it appears that Stardoll will choose a talented designer each week and feature them on the Star Designers page. They are also showing some basic info about the featured designer, along with their best designs, and top 5 picks from Starplaza. (I am not sure how they picked those though.) On the same page they have shown also top 5 designers, and displayed an achievement we saw before in spoiler, which will each featured member receive. What do you think about this new update? And what designers you think should be featured?